HI-ETCH FILLER PRIMER is a fast drying self etch primer with active protecting against corrosion for the car and vehicle repair sector. Adhesive on iron, steel, zinc and aluminium. Welding tested in accordance to DVS 050. 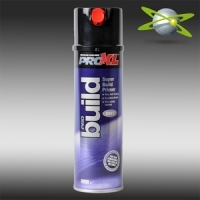 Professional spray for minor repairs, and for surfaces which have been partially abraded down to the bare metal. USE: The substrate must be clean, free from corrosion, grease, oil or polishing agents. Zinc substrates. Do not overcoat with polyester materials. Shake can vigorously! Spray sample first distance 20-30 cm. Spray on several light coats in crisscross fashion. After use, turn can upside down and spray until the valve is empty.